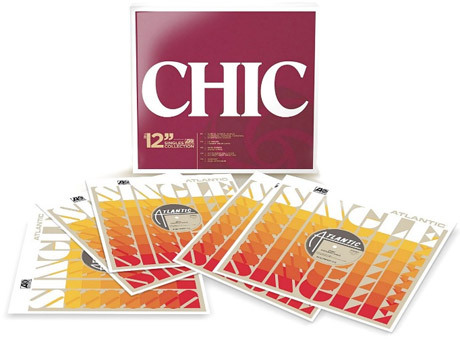 Thanks to his prominent contributions to Daft Punk's Random Access Memories, guitarist Nile Rodgers has been having a banner year, and he's keeping the momentum going by releasing a box set of 12-inches with his classic disco group Chic. The collection, which is functionally titled 12" Singles Collection, is due out in Canada on August 27 through Warner Music. It brings together 10 of the band's best-known hits. Each song is given its own side, and tracks include "Le Chic," "Good Times" and "Dance, Dance, Dance (Yowsah, Yowsah, Yowsah)." See the tracklist below. It's available to pre-order on Amazon. In other good news, Rodgers recently announced that he had beaten cancer. He also said that he is looking into releasing some archival material, and Daft Punk are apparently interested in working on one of those old tracks.